See also the editions in German and French. As in the other languages, a guide to the Rhine was the first series to be started in English. 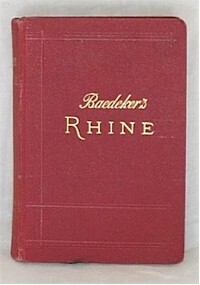 In publishing the first edition of "The Rhine", Baedeker took the competition with the British Murray travel guides straight on to their own ground. It must have been a bit of a gamble, but ultimately, it proved a successful one. After the 4th edition, Northern Germany was spun out into a separate series.